While Ireland is a very modern European country, our ancient roots are still underfoot with every step. Sometimes literally. When you walk through Dublin, Cork Galway or any Irish village, you are walking down the same roads our ancestors took. The ruins that were their everyday buildings are part of our landscape along with the modern buildings. And the beneath the ground we pass over every day, lie buried treasures from our past. It’s easy to forget that in the hustle and bustle of everyday life, it the sense of history and magic in the air is one of the best Irish gifts. And in June, a Donegal farmer got an extreme reminder of how close we are to our past. 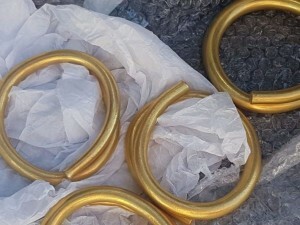 The farmer was doing some drainage work, and one his crew lifted a stone and discovered four gold bracelets underneath it. He showed them to a friend is a goldsmith, and that person knew immediately how rare and amazing the treasure really was. The four gold rings, large enough to be worn on a wrist not a finger, are now with the National Museum of Ireland. Museum staff travelled to Donegal to inspect the site where the items were found to see if it yielded any clues about how, when or why they were left there. The rings were under a stone, but the museum has not made any announcements about whether this was an ordinary rock or a possible monument or the remains of some kind of structure. The National Museum believes the rings date back to the Bronze Age. The museum announced it wants to put the four rings on public display as soon as possible. The rings are simple in design. They appear to be a thick, round gold wire wrapped into a circle with the ends overlapping. No obvious signs of embellishment or engraving have survived. The diameter of each ring is approximately ten centimetres, or just shy of four inches. They might have been very small bracelets, or they might have had another purpose entirely. Hoards and prehistoric finds have been discovered all over Ireland, giving us growing insight into how our ancestors lived. Bronze Age items have been discovered all over Ireland – in Offaly, Wicklow, Derry, Mayo and Kerry. The Bronze Age spans from 2500 to 500 BC. The key development of the era was metal work. Now people could fashion tools and ornaments from bronze, copper and gold. Other Bronze Age finds have included pottery as well beads, axes, daggers, knives and caldrons. In the Bronze Age, jewellery marked people’s social status. They wore bracelets, torcs and lunale. Bracelets and torcs are still popular Irish gifts! Lunale are a neck ornament featuring a crescent shaped plate of gold. The most remarkable one is perhaps the Croggalbeg lunala found by a farmer cutting turf in County Roscommon in 1945. These finds do more than teach us about how our ancestors lived. They also remind us that we walk in their footsteps here, with layers and layers of history and magic beneath our feet as we go about our most mundane chores.